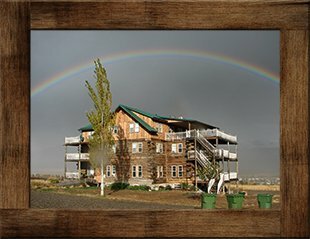 The Syringa Lodge is located on a bluff overlooking the town of Salmon, Idaho as well as the Salmon River, and has an unobstructed panoramic view of the surrounding mountains. The lodge is built of large spruce logs on 19 acres of an old homestead and the entire lodge has recently been renovated and redecorated. WE DO NOT ALLOW PETS. 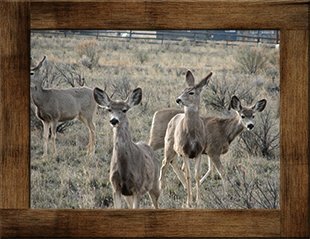 While at the Syringa Lodge, you may enjoy the views from your room or any one of the six porches, or watch the herd of deer graze in our pasture. Each bedroom is uniquely decorated and has a king or queen sized bed and a private bath. Lounge in front of the great room fireplace with its seven-foot beautifully carved pine mantle and enjoy a home-cooked breakfast in the dining room. Sit and watch the sunset light up the snowcapped Bitterroot Mountains. Walk our trails down to the Salmon River or to our gorge view bench. The town of Salmon lies only a short mile way for you to visit as well. 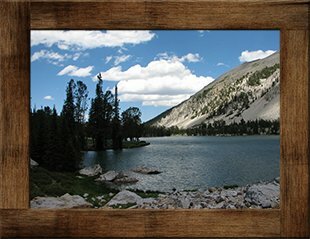 View our webcams to see live video feeds of the Salmon, Idaho area!